In late 80’s Gin Blossoms started to grow a huge following as the #1 local music draw in Phoenix and certainly were the hometown hero’s of their favorite hang, Tempe, Arizona. Gin Blossoms indelible jangle-pop sound was evolving during radio’s diverse mix of hair bands and grunge music superstars like Nirvana. After the Phoenix New Times chose them the cities best rock band, they qualified to play at the South By Southwest Music Festival in Austin Texas in 1989. That same year, College Music Journal dubbed them the “Best Unsigned Band in America” and added an invitation to perform on MTV’s New Music Awards in New York City. 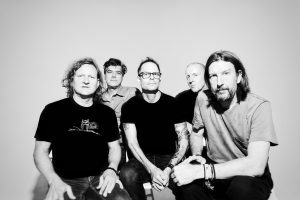 Taking their name from a caption on a W.C. Fields photo, Gin Blossoms signed a record deal with A&M and recorded their first EP “Up And Crumbling” in 1991. But, it was not until their breakout record “New Miserable Experience” in 1992 that their rise to fame began. “New Miserable Experience” kept the band on the charts for almost 3 years with singles “Hey Jealousy,” “Allison Road,” “Until I Fall Away,” “Mrs Rita,” and “Found Out About You.” The album took the airwaves by siege and held MTV hostage with multi cross-over hits in 4 different radio formats. It was this record that rocketed the band into the mainstream going on to sell over 5 million copies making the band a 90’s radio mainstay. In 1995, Robin Wilson, Jesse Valenzuela and veteran composer Marshall Crenshaw wrote the bands 4th of 9 sound track inclusions; “Til I Hear It From You.” The smash hit was released as a Gin Blossoms single and it appeared on the platinum sound track for the film Empire Records. 1996 saw the final record of the decade for Gin Blossoms “Congratulations I’m Sorry.” The album brought two more hits; “Follow You Down” which spent ten weeks in the Top Ten and “As Long As It Matters” which earned a Grammy nomination for Best Performance by a Duo or Group. “It was pretty cool to lose a Grammy to the Beatles. Who else would you want to lose out to” say’s Jesse. The album rocketed into Billboard’s Top Ten and a year of touring helped push the record past 1,500,000 in sales. In 5 years, the band released 2 EP’s, two LP’s and over 12 singles that fuel today’s record sales to over 10 million. Their blend of Pop & Rock, now known as Jangle-Pop, became a musical force that helped define the sound of 90’s radio. Their next album, 2010’s “No Chocolate Cake”, lands Gin’s back on the singles chart again with “Miss Disarray” and the album shot straight to # 1 on Amazon, hitting Billboard’s top 200 at # 73 and the Indie chart at #14. Because the band members no longer live in the same city—Wilson divides his time between Tempe and New York, Valenzuela is in Los Angeles, putting the sonic pieces of No Chocolate Cake together presented an exciting new challenge for the band. While Wilson contributed a handful of songs, the bulk of the material chosen for the 11 track set was written by Valenzuela either solo or with different collaborators, including Danny Wilde of The Rembrandts (the Blossoms guitarist first worked with Wilde on The Rembrandts’ song “Long Walk Home”). Over the years, Gin Blossoms have toured over 25 different Countries including a five city tour of Iraq in 2010. “It was so much fun to entertain our troops. It’s really insightful to see first hand how our troops live in a combat zone. It really helped widen my understanding on the sacrifices they make to protect us at home and abroad. I hope all Americans understand how important it is for us to extend our thanks” says Robin. “I look back on the big tours we did in our heyday – playing sheds with Neil Young and The Goo Goo Dolls, touring Europe with Bryan Adams, things like that – and it was easy to take it all for granted. I’m really glad we’ve been able to earn our way back into that realm” say’s Wilson. The road has also proven exceedingly fertile ground for both Valenzuela and Wilson, with each talented tunesmith promising the inevitable arrival of new Gin Blossoms material. As they approach their third decade, Gin Blossoms remain a rare breed – rock ‘n’ roll lifers, destined to continue creating, crafting, and performing for audiences ever rapt by their glorious catalog of material. The band performed in over 100 cities in 2017, and with additional promotional stops 2017 was one of the busiest touring years since the early 90’s. 2017-2018 laps the 25th anniversary of the bands 5 times platinum album New Miserable Experience. 25 New Miserable Years Tour will be stopping in over 40 cities in November, December and in February 2018.